A Niagara Falls getaway is the perfect summer trip. With incredible sights, attractions, entertainment, and dining, the city offers a wide selection of experiences that you won’t want to miss. So here’s our guide to an amazing weekend adventure in Niagara Falls featuring some of our favourite family-friendly destinations and activities. One of the first stops on any visit to Niagara Falls should be the brink of the Canadian Horseshoe Falls. A walk along the Niagara Parkway from the bottom of Clifton Hill towards the Table Rock Welcome Centre will take you past the rushing waters of the American and Bridal Veil Falls to the breathtaking brink of the Horseshoe Falls. 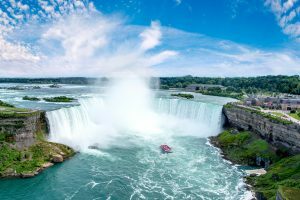 With more than 3000 tons of water flowing over the Horseshoe Falls every second, it’s a spectacular sight to see and will be a highlight of any visit to Niagara. And you can buy your tickets in advance to save time on your visit! Take a break from sightseeing and enjoy a delicious lunch or dinner at one of Niagara’s many great restaurants like Fallsview Buffet Restaurant, Hard Rock Cafe, and Rainforest Cafe. Fallsview Buffet Restaurant’s dining room offers spectacular views of Niagara Falls from floor-to-ceiling windows while Hard Rock Cafe and Rainforest Cafe offer adventures in themed dining that people of all ages will love. This street is always bustling with activity, but nighttime is a great time to explore everything that it has to offer as it comes alive with electric energy and sparkling lights. In celebration of the 25th anniversary of the Falls Fireworks Series, Niagara Parks has scheduled spectacular fireworks shows over Niagara Falls every night of the week until September 3rd. The shows take place at 10pm and can be best enjoyed from along the Niagara Parkway, at the Table Rock Welcome Centre, or from a Fallsview guestroom at one of Niagara’s top hotels. 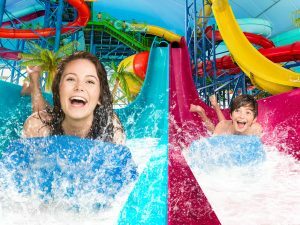 Spend the afternoon splashing around at Fallsview Indoor Waterpark and experience 16 waterslides, a full-size wave pool, 1,000 gallon tipping bucket, year-round outdoor activity pool and sundeck, plunge bowl, adult-only Jacuzzis, and more. And we have a number of great Waterpark Getaway packages that will make planning a family-friendly getaway to Niagara Falls convenient and easy! Refuel from your exciting waterpark adventure at Freshii, located inside the lobby of the Sheraton on the Falls hotel. You can grab some healthy and delicious items like burritos, wraps, salads, smoothies, and bowls and then head over to Queen Victoria Park located right across the street for a relaxing picnic. Before you leave Niagara Falls, stop by the Great Canadian Gifts Shop at the bottom of Clifton Hill to pick up some unique souvenirs, merchandise, and gifts. The shop has a huge selection of Niagara Falls items and treats, which will help you commemorate your amazing visit to the city. All great weekends must come to an end, but don’t worry, you can start planning your next Niagara Falls getaway any time you want!